All over lace. a fab dress. Victorian boned jacket in black with an off white collar. It is boned with a lace panel to the front and back. ( 9 Bones). The white area's are soiled. Pretty sleeves with a deep lace cuff. Satin covered mock buttons to the front and back. White cotton lawn petticoat with fine lace. 1980s Original Lace Black Ballgown Victorian/Edwardian Special Occasion. Decade Original/ Reproduction Material Colour Style Look Occasion. Lovely black spot lace that shows beautifully on the sleeves and top of the bodice. This is a stunning silk satin 2 piece. I think it’s Victorian but could be Edwardian not 100% sure. In Duck egg blue although there’s fading in the silk satin darker in the folds. The silk shows weakness on one arm fold area around neck area and under arm. Women’s Vintage Cream Floral Lace High Neck Blouse Top Size Uk 12 Great used vintage condition. Tiny stain on front grill. 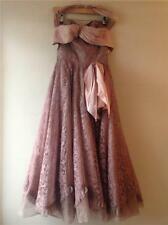 Size approx Uk 12 - please check measurements below shoulder to hem 22” pit to pit 20” shoulder 15” 75 polyester 25 nylon. Machine washable. Please feel free to ask any questions so that you can bid with confidence. I am pleased to offer this lovely blouse suitable for steampunk or Victorian reenactment. Excellent condition. Size 34" bust. 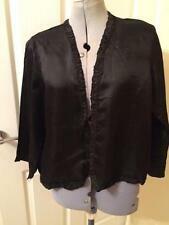 Vintage Style Edwardian BNWOT Black Tulle Net Lace Blouse UK14.Dispatched with Royal Mail 2nd Class. Unbranded,never worn. Made of sheer 100% cotton tulle net lace with crochet lace panels. Round neckline,long sleeves,concealed buttons down the back. Approx UK14 chest 38" length 20". Antique Victorian, Edwardian pale pink linen skirt with lace trim over the vertical seams and 8 curved pintucks which flow round the whole of the skirt. 20.25” waist. Beautiful authentic Edwardian blouse in a delicate intricate lace edged with pale pink satin on the cuffs and neck. It has an elasticated waist, but I think this is a later edition. EDWARDIAN LACE BLOUSE. Sheer sleeves, velvet bow and lace overlay over a satin type material. Fabulous Evening PARTY Glamour RARE. Im not entirely sure which material it is as im not an expert, however of very high quality, thick and shiny material. Stunning vintage st Michael linen blouse with pretty lace trim to collar and cuffs , gorgeous feature buttons , very flattering style . In excellent as new condition . Please see item specifics for measurements . Bust 140 cm. Length 112 cm. Great condition overall, just one almost unnoticeable small mark. There are a couple of original repairs (patches), and tiny speck stain otherwise good condition. There are a couple of tiny speck stains otherwise good condition. No signs of wear. No size label but suitable for a size 10 to 12. There is no material label but feels like silk and the care label suggests that it is. The stunning lace collar and the fabric covered buttons just add so much luxury, you will look amazing in this dress! I hope you will like this dress as much as I do! The detail is truly stunning. The ties at the bust are made from a synthetic looking ribbon but these may have been added at a later date. Ladies Blouse by M&S. "This is a stunning Piece ~. Size approx. U.K. 18 -20. ~ Victorian ~ Edwardian style look. In Very Good Condition. This can be worn as a little slip over jacket over a cami or dress for added elegance. SHOULDER TO SHOULDER 17”. SLEEVES (SHOULDER TO WRIST) 17.5”. LENGTH 21.5”. SLEEVES (UNDERARM TO WRIST) 12”. This is a beautiful classic Laura Ashley sailor dress. It is made from a navy linen cotton mix. It has delicate cream lace trim to the collar. The dress is double breasted with button fastenings at the front. Antique late Victorian long nightgown or shirt, which has been produced from white cotton, with embroidered whitework detail and crochet lace to the neckline and sleeves. AGE Late Victorian, circa 1890 MEASUREMENTS Length - 50" (shoulder to hem) Bust - 46" Sleeves - 23" CONDITION The nightgown is in a good antique condition, please refer to the above photographs for details of condition. 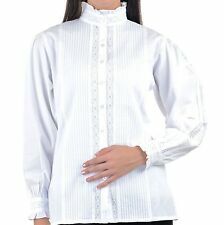 Laura Ashley fine white cotton long sleeve blouse with lace trims. Victorian / Edwardian high neck style. It is in excellent condition, except for a tiny 3 mm mark, on back of blouse by left shoulder/arm join. This lovely cream lace blouse is a fabulous piece to add to your wardrobe. It has been worn twice and is in good condition as shown in the photos. - Waist: 19". - Length: 26". An antique Victorian black mourning cape. There is hook and eye fastening to the front. The cape is made from two layers of black lace, the top layer decorated with three bands of clusters of tiny black glass beads and edged with black silk satin ribbon. Collectable Antique Fashion. Since this item is Victorian, it's very small (UK size 0-2). Green & Black Lace. Beautiful 1970s full length floral maxi dress in crisp cotton with puffed sleeves. The neckline and bodice are trimmed in lace and velvet ribbon. The dress is handmade and zips up the back to fasten. In excellent vintage condition with no holes, stains or issues to note. Beautiful cream lace blouse - original 70's - stunning large Puffed Sleeves. Featuring 10 pearl buttons down the front of blouse, fastening all way to the collar. 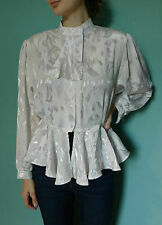 Perfect Blouse for Victorian/Edwardian/Gothic/Steampunk/Boho/Party/Festival Wear. Made from a heavyweight linen fabric, unlined. Has a classic slight A line maxi/kaftan smock dress shape, with crochet lace detail to neckline, sleeves and hem. Belt pictured not included . Length : Maxi length. There are a couple of holes photographed but nothing else.no perished areas, no tears in the bobbin lace, no sweat marks. Stay material remains on the edgeing so this top may not have been worn. A simply elegant 60's column dress, looks fabulous on. Beautiful Antique flouncy cotton petticoat lace trim. 30inch waist. Beautiful antique cotton petticoat with lace trim, 1 large pocket, 30inch waist can be maid smaller with drawstring, has 3 button holes on sides 1 original button, 1 missing, 1 replacement, approx 37" long,original laundry markings, this petticoat has some stains as I have tried to show, it has been washed & ironed, Questions welcome. Obviously this piece was made over forty years ago, using fabric which was already antique so as the label says, it's fragile. That said because of the lining and the style it's actually incredibly wearable. RARE OPPORTUNITY TO BUY A 1980's BRIDAL ROBE. VICTORIAN/EDWARDIAN IN STYLE WITH PINTUCKING, COTTON LACE, RIBBON. PINTUCKING AND COTTON LACE FRILL TO FRONT AND BACK TO BUSTLINE. FRILL TO NECK - EDGED IN LACE WITH THREADED THROUGH RIBBON. 16" X 19". IN EXCELLENT CONDTION. FROM ESTATE OF A LATE RELATIVE. PRETTY ITEM AND HAS BEEN LOOKED AFTER. ITS A GOOD WHITE STILL. ANTIQUE 19TH C LADIES V NECK NIGHTGOWN ROMANTIC WHITE COTTON & LACE B 40"
A LOT OF HAND FINISHING - AND PIECING TO BODY ( INFERS MADE OF USED COTTONS - LIKE SHEETING ). ANTIQUE 19TH C COTTON NIGHT DRESS - NIGHT GOWN. BUST 40" - BUT NEEDS TO BE VERY LOOSE - SHOULDERS ONLY 17". FROM ESTATE OF A LATE RELATIVE. IT WOULD MAKE A LOVELY PAIR OF REALLY OLD PILLOWCASES. LENGTH (NAPE OF NECK TO HEM) 24". SHOULDER TO SHOULDER 16". Long puff sleeve stripe lace top! 1940's Victorian,steampunk,prairie,Wild West! This verstaile top can be worn in lots of different ways! The sleeves can be worn down for a flat shouldered full length sleeved look (see pics 1 & 2!). or pushed up for a full,puffed sleeved look with the sleeves being 3/4" length (pics 3 & 4!). Size - 10/ 12. Shoulder 38cm. Length 150cm. Black lace net dress embellished in black glass bugle beads and sequins. pale gold coloured stretchy lining. very 20s deco flapper downton abbey vibe. great for party. lace panelled sides and lace inserted pleats to bottom.